1- Factors of recurrence of intraepithelial lesions of the uterine cervix. 2- Duodenoscopy and endoscopic retrograde cholangiopancreatography (ERCP) in the diagnosis of biliary and pancreatic pathology. 4- Natural history of fetal pyelocaliectasia. 7- Pressure ulcer management--Evidence-based interventions. 9- Genital ulcers caused by sexually transmitted diseases: current therapies, diagnosis and their relevance in HIV pandemy. 10- Current management of gout. 12- Tarlov's cyst: definition, etiopathogenesis, propaedeutic and treatment. 13- Antibiotic treatment of uncomplicated cystitis in non-pregnant women up to menopause. 15- Urolithiasis and renal colic. Therapeutic approach in urology. 16- Surgical basic skills: surgical sutures. 18- Glioblastoma multiforme... with multifocal presentation. 19- Differences between SSRI's pharmacokinetics and pharmacodinamics. The Impact Factor of AMP increased in 2017 from 0.498 to 0.581! 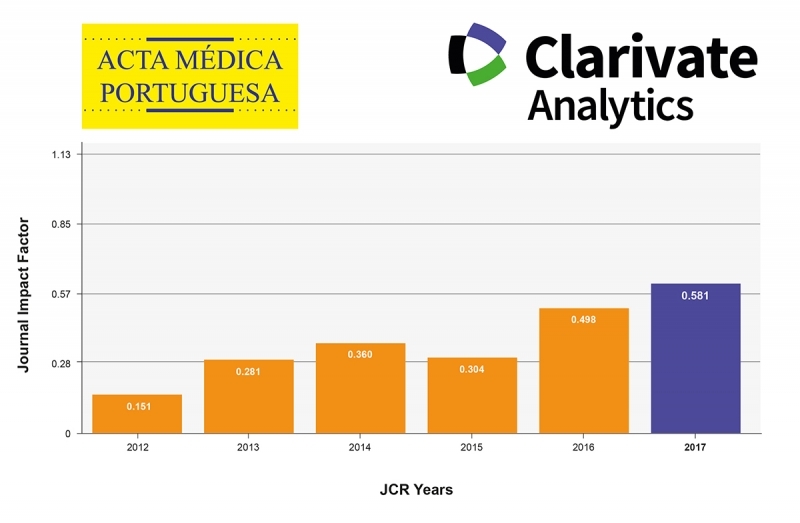 The figures recently reported by Journal Citation Reports® correspond to the number of citations obtained during the year 2017 of articles published in AMP in 2015 and 2016 divided by the number of articles published in the aforementioned years. This includes a total of 133 citations related to 229 published articles. 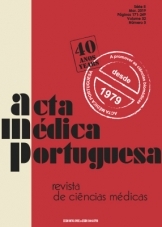 The scientific journal of the Portuguese Medical Association aims to promote state of the art knowledge through manuscripts of scientific quality and to defend ethics and respect for human dignity, within a context of editorial independence and impartiality.